Reinforcement is one of the top combinations in the sale offering for moderate birth weight and calving ease combined with outstanding weaning performance. Both his Birth Wt. EPD and Weaning Wt. EPD are among the top 10 Optimizer bulls in the sale offering. His grandmother is an ASA Silver Dam with an average weaning ratio of 103 on 5 calves. 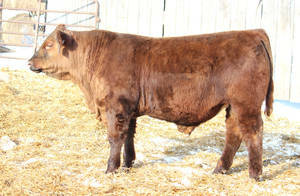 His great-grandmother has an average of 100 on 10 calves and is the dam of LOT 118. Small scur removed. 50% Red Angus.